Has your vehicle reached the end of its life after accumulating years of wear and tear? Is it damaged, salvaged, not drivable or rusted? Are you having a tough time in paying the regular maintenance costs of your vehicle? Car Wreckers Greenacre 2190 team @ WreckMonster can help you. Have you made the calculations, and found that it would be cheaper to buy a replacement vehicle? Is the machine taking up a large chunk of valuable space in your back or front lawn? If any of the above questions apply to your vehicle, then it is most probable time to get in touch with Wreck Monster – Sydney based Auto Wreckers operating through Greenacre, NSW. We are just a call away, and our crew are ready to take your junk vehicle off your valuable property in exchange for the most possible cash. Our removal services cover the complete south, north, east and west Sydney for free removals. Wreckmoneter crew are the leading locally owned Auto Dismantling and recycling business in Sydney. We offer an excellent professionalism and expertise in all their automotive deals. We buy all kinds of vehicles for recycling purposes, regardless of type or model. This includes cars, trucks, SUV’s, Utes, vans and 4×4’s. The Good news is that we won’t charge you even a single dollar while hauling it away. Instead, you will get ready cash paid in your pocket. It is a bitter truth that at some point of time all vehicles reach the end of their transportation careers. You may have accumulated a whole lot of lovely memories with your vehicle. However, you shouldn’t shed a tear over the fact that you must say goodbye. You will be able to buy another one. Selling a junk car is nearly impossible when doing so via the normal channels. But hold off on the rush of despair you may feel at knowing this information. Because we are guaranteed to buy it off you. The experts on Wreck Monster value all automobiles, whether it is scrap, junk or even written off. We will pay you up to $15,000 cash for your Japanese, Korean, American, European & classic vehicles. At Wreck Monster, you can enjoy stress-free, responsive and fast scrap or junk removal services. In fact, we are so fast at our services, you can be sure that we will buy your vehicle off you within the same day. We do this by providing free pickup from your location (anywhere in Sydney, NSW), no matter where you live in Greenacre. Thus, saving you from the hassles of searching buyers for your automobile as well as from the expense of towing it. We cover almost all the major regions in NSW, check out servicing locations for more directions. We offer competitive money offers at such high rates that cannot be matched by our competitors. This is why, we are able to assure our customers that they are getting the right pay-out for that their automobile deserves. If someone offers you more money than us, tell us and we will match that offer. If you are worried that whether or not we will take your type of wheels, this is a perfectly understandable concern to have. However, you don’t need to be stressed. We accept Cars, Utes, Vans, Trucks, SUVs and all other unwanted automobiles irrespective of what brand or year it is. This is in stark contrast to those companies out there that only by the most popular brand of scrap car. Our passionate scrap experts love to buy Mazda’s, Toyota’s, BMW’s, Daewoo’s, Volkswagens, SsangYong’s, Suzuki’s and Subaru’s. If it is a BMW, Nissan, Isuzu, Lexus, Holden, Ford, Mercedes Benz or Honda model, we will buy that too. Generally, we will buy any make, model or brand. If the automobile make your own is not in the aforementioned list, never fear. We will still buy it off you without a doubt. If you don’t want your car to contribute any more to the pollution of our planet any more than it already has, you will be glad to hear that we recycle cars completely. Any and all toxic materials are recycled or disposed of properly. This makes sure that they don’t harm the wild life or plant-life. This should help you rest easy. Getting the necessary part for your vehicle, so that you can get it back on the road, should never be a struggle. Yet all too often it is. But not with us on the scene. If you need to buy a part for your automobile, don’t pay through the nose for a brand new one. Buy it second hand, and buy it from us! We stock a wide range of quality used parts for all light and heavy-weight automobiles. When booking a part for your vehicle, you can easily rely on us. The reason being that our proficient Dismantlers offer reconditioned parts that are inspected and cleaned properly. All our parts are worth purchasing since they offer the same performance like new ones. Book used car parts online now. That way you will be able to get your vehicle fixed up and ready for driving again, without spending all your rent money in the process. So, you have made the correct decision on what to do with your old scrap car. The next step is simple to complete. 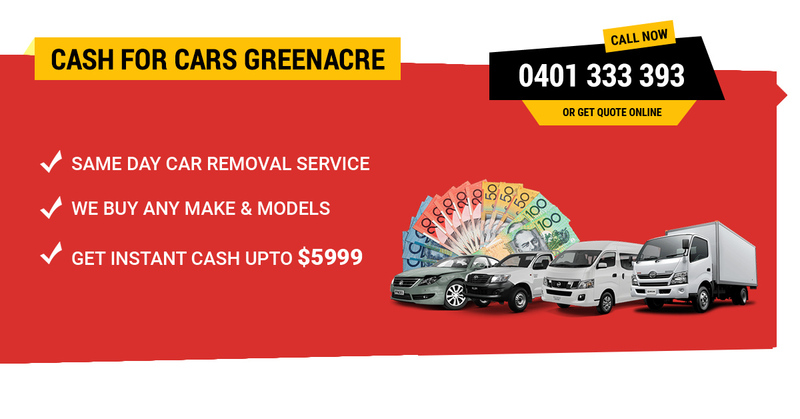 It is very easy to request a no-obligation cash quote from our Car Wreckers Greenacre 2190 crew. There are two different methods for contacting us. Simply give us a call on our number 0401 333 393 or complete our online inquiry form. The moment you are done by providing us all essentials of your vehicle, such as the age, condition, make and model of your vehicle, leave the rest of us. We will take all the hassles and arrange everything for you from paperwork to towing your automobile with cash payment in hand.